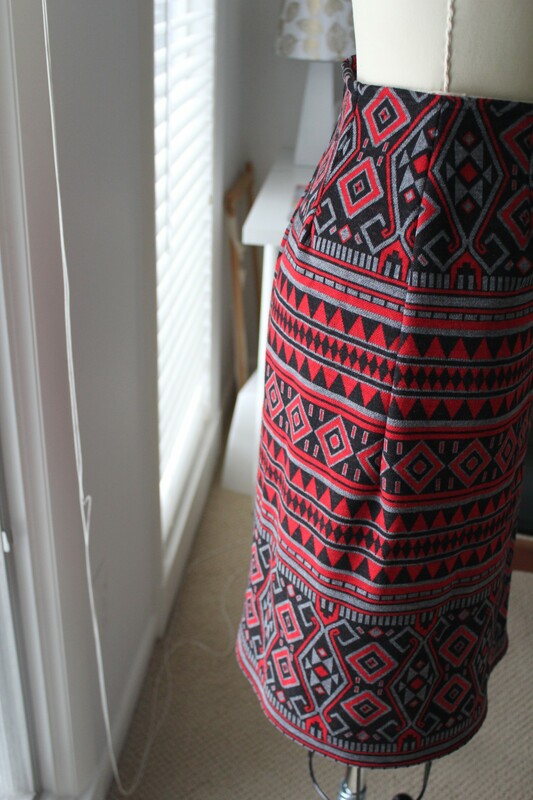 Sometimes I find I need a quick & easy project to get back into the sewing vibe. That’s definitely what this skirt was. 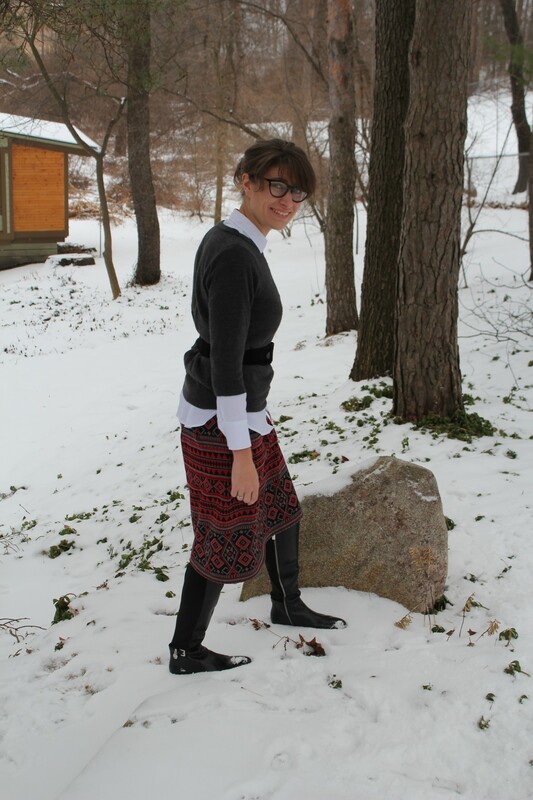 I had a small piece of patterned knit material (about 1m x 0.75) that came from my husband’s late grandmother’s stash. 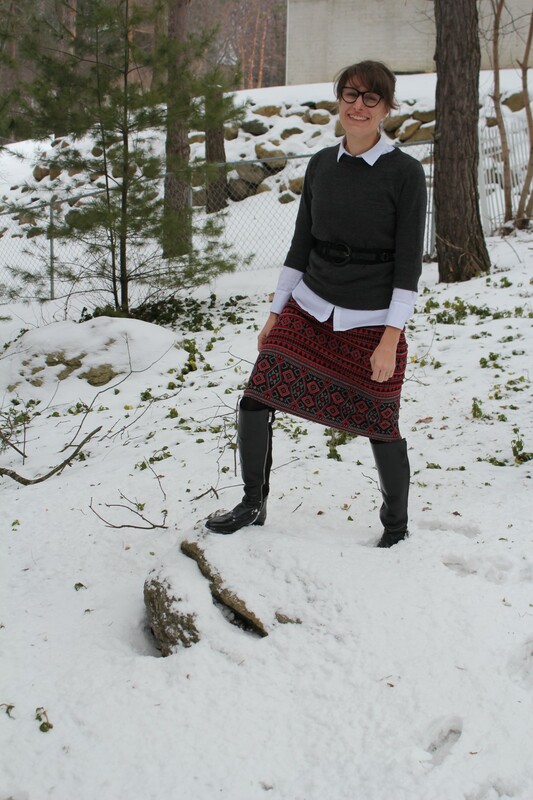 I’d always thought it would make a smart winter skirt but just never got around to making it. One benefits of winter in Michigan being so cold is that I can’t be bothered leaving the house and so I tend to sew from my stash rather than going to the store for new fabric. In Australia I’d often head to my favourite fabric stores looking for ‘inspiration’ & coming home with more fabric than I really needed. It was like the sewing equivalent of going to the shops to get a new belt for work & coming home with 3 pairs of pretty shoes, two new cocktail dresses, a handbag & no belt for work. Needless to say when I wanted to sew something this morning that I could wear this afternoon & looked at the thermometer outside my kitchen window I decided it would be a good idea to take a look in my fabric stash. I happened upon this fabric & thought it’s about time to finally make this a skirt. In order to keep the pattern as matched as possible I converted the side seams to darts & then I only had to match up the rear seam. I adjusted the darts & side darts ever so slightly so that I could get the fabric pieces to match at the back. The side dart section doesn’t match perfectly but the lower area does, so I’m pretty happy with that. There is a bit of a weird kick up at the zipper, but it’s normally covered by a top so I’m not going to waste heaps of time trying to fix it. I put an invisible zip in but after trying it on I realised that there was enough stretch in the fabric that it probably wasn’t necessary but it’s better than finding out the reverse. Plus I wanted to try out my fancy new invisible zipper foot, (turns out it’s fricken’ awesome). I’m going to keep this post short & sweet – like the skirt 😉 Hope you all have a great weekend!